A picture from one of Michael’s recent posts: "Major Mark Bieger found this little girl after the car bomb attacked our guys while kids were crowding around." Michael Yon writes compelling dispatches about what is happening in Iraq. The picture that emerges from this carnage is savage, but reassuring. Iraqis are slowly, but surely building a society where decent people will have a future. Iraqi citizens and our soldiers deal with daily suicide attacks with a continuing determination in spite of mainstream media determined to show otherwise. It is increasingly obvious that their citizens and our soldiers are bringing order out of chaos. The "invisible" insurgents who seemed omniscient and omnipotent are now being revealed as killers for hire — street thugs who talk with street dialects, rather than religious zealots. A new smash-hit television show: "Terrorism in the Hands of Justice" features captured insurgents telling their stories. These hour-long episodes without commercials are shown six nights per week on a government-owned, US-sponsored station. Translators working for the US Army say they "love the show," "watch it every night," and that Iraqis "downtown" chatter every morning about the latest episodes. If you want to get a better understanding of the forces at work in this emerging democracy, you should take time to read Michael’s weblog. He is with the 1-24th Infantry Regiment of the 25th Infantry Division, whose soldiers are fighting some of the most serious insurgency battles in Iraq. It’s sad. This war should never have happened. What now? What a mess! You are a hero in the eyes of every American. You put your life on the line every day, just so you could let freedom ring. I hope you have a safe journey in this war, you will always be remembered in my heart. (I showed this pichure in front of my intire senior college class……they alpaud you). Even though I do not agree with why you are their in the first place, you should be here, safe…were you belong!! Hey brother! Stay strong. You will get thru this and just keep doing the good you are doing out there. I know it is hard to see this mess. I have been there. I keep supporting you guys and will keep you in my prayer. 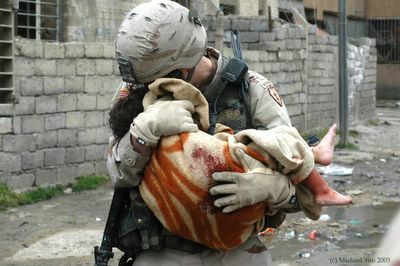 Regardless of why we are out there, those children need to remain safe from all that evil out there that me and you and those troops have seen day after day. Regular civilians don’t see it or understand the reasons why we are doing what we are doing. God is watching over you. If you need anything, just let me know. Stay focused and help those who can not help themselves. Love ya bro! The Americans destabilized the entire region now they can’t stop all the violence which is claiming innocent lives including children. Maybe Saddam Hussein should have never been killed but placed back into power. He understood the Shiite and Sunni and he was the only one who was able to maintain control. He understood that Iran’s Shiite population always wanted to take control of Iraq and now this is what is happening. Sad to say but my country should get out of Iraq! when I see the horror in Iraq, I think that the images are showing that we are in a inferior level than animals. They kill only for necesity (hungry) but never kill for ambicious and evil plans. It’s not fair for both sides; Iraqi & American, we have in Jordan more than 1 million Iraqi refugee mostly shiiat, who’s reall really hate Americans & us of course, they even start to make there own lobby. And if we start to stop them we are being accused by HRW of violating there human rights! I pray that this bloodshed ends soon for every one’s sake, may this brave soldier return to his family safe I salute him and my god be with the child’s mother.